Ride all night on the bus. Get off. Suit up in ill-fitting, but very cool, old-fashioned uniforms. Watch the rain for three hours. Step on the field some time after 10:00 pm. Do we really have any confidence in the fellow on the mound? In the last seven starts he’s got three losses (counting last night/this morning) and four no-decisions. 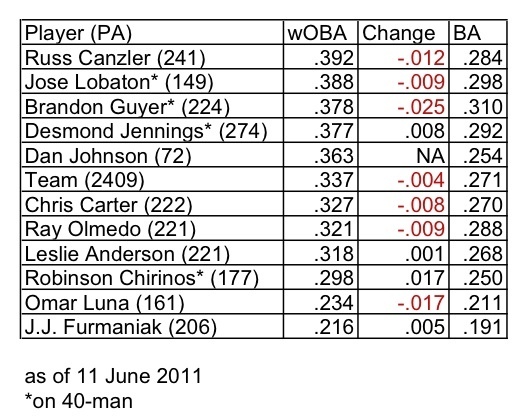 Still, his numbers are only slightly less awful (ERA 4.24) than the awful starting pitcher numbers (ERA 4.32). The Rays, indeed all of baseball, are much more tolerant of potential left-handed talent. So we can only hope that time, coaching, experience, maturity, etc. lends a hand. Alex Torres is ours for the year. The goat of the game, however, was Brandon Guyer, who misjudged/lost in the lights a Ryan Hughes fly ball in the 5th. That double kept the Tides ahead of the Bulls and (from my bleary-eyed seat in front of my television) made a big difference. For the first time in my memory (notoriously flaky, I should point out) a Bulls pitcher has appeared three games in a row. R.J. Swindle has pitched 1/3 of an inning (4 batters) in each of the last three games. DRR mentioned in the comments last night, and several sources are reporting, that with the return of Elliot Johnson to the roster the Rays have designated for assignment Felipe Lopez. If no team claims him (and none did last time), and he accepts the assignment, he could be coming back to Durham. How are the hitters doing? The last time we looked was May 26. 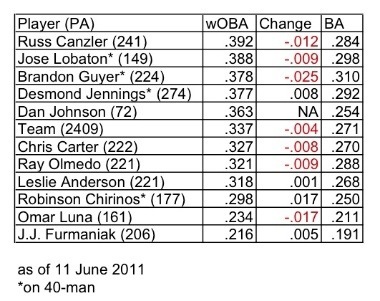 Again, the table is sorted by wOBA. As can be seen, over the two weeks for almost all our hitters, the numbers are down. The only hitter who’s significantly up is Robinson Chirinos, but he had quite a ways to go.